O'Hare continued collaborating with lyricists, initially a friend from Shreveport and then other lyricists. 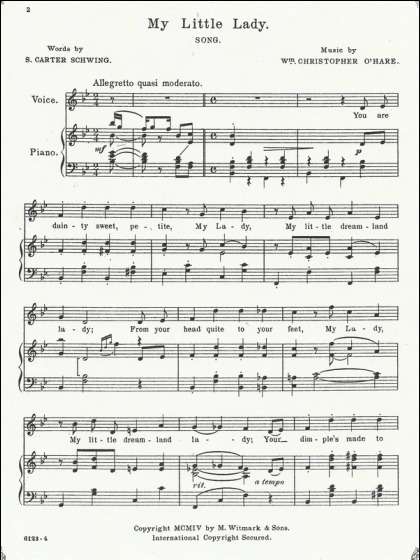 One result was an assortment of songs published for single voice and piano. 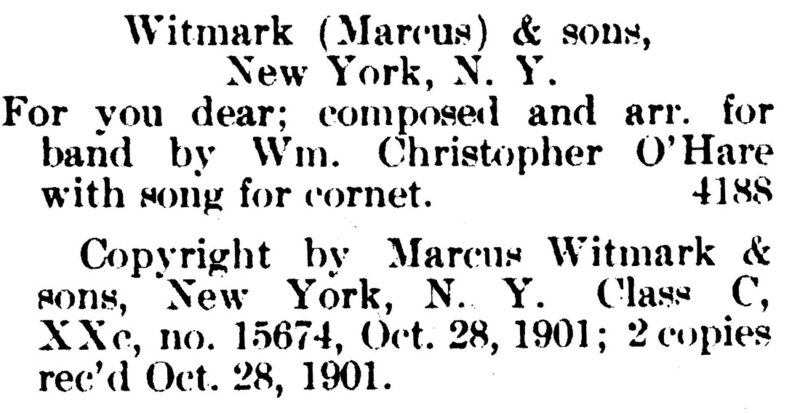 From 1901 to 1904, the Witmarks published several songs with lyrics by S. Carter Schwing and music by William Christopher O'Hare. Early Shreveport papers reveal that S. Carter Schwing was assistant principal at Shreveport's public high school. By 1903, Schwing appears in the New Orleans directory as a teacher at Spencer's Business College, and by 1910, he had been promoted to business college principal. In 1894, Lucius Clay Spenser started his business college in Shreveport, but he relocated to New Orleans in 1897, hiring Schwing at some point before 1903. Samuel Carter Schwing, approximately six years younger than O'Hare, died in 1951. 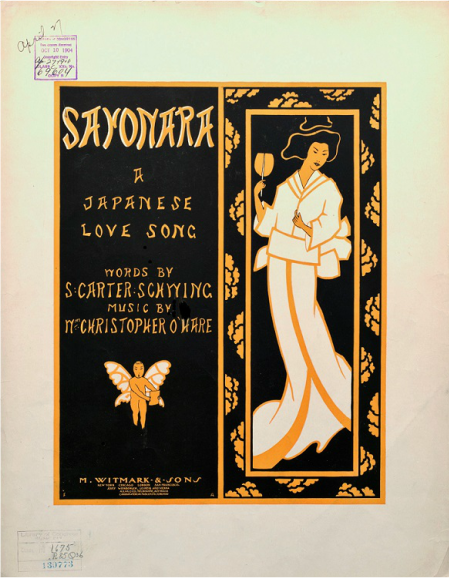 Although O'Hare and Schwing composed and published For You, Dear as a song, O'Hare also arranged it for cornet and trombone solo with band accompaniment and for mixed voices..
Like O'Hare's 1904 instrumental Ky-isses, this song must have been inspired by the Russo-Japanese war. Carter Schwing's first verse describes a young couple's sorrowful parting. Verse 2 speaks of his sailing away, of her tear-stained face watching and praying for his return, and of her parting words still in his heart. Her parting words form the chorus probably strike today's readers as politically incorrect or as humorous because of the rhyme : "Sayonara, my 'Little fighting Jap'--the bravest soldier upon the map--Now Sayonara, I'll ever faithful be, --while you are fighting for your country and for me." Popular Tin Pan Alley lyricist Bartley Costello collaborated with a number of well-known and lesser-known composers such as Harry Armstrong, Kerry Mills, Al Piantadosi, and James W. Casey. His best known song may well be If You Had All the World and Its Gold. Eva Wallace, wife of singer Franklyn Wallace, was a serious actress and opera singer who turned to vaudeville and became known as "The Girl with the Smiling Face." O'Hare's Witmark collaboration with actor Frank Sheridan on songs such as Sweet Love of Mine and Farewell Welsh Rarebit most likely led to O'Hare's later years of work for John Franklin Music Company, owned by John Franklin Sheridan. By using a shortened form of his middle name and his last name as his stage name but using his first and middle names for the publishing firm, John Franklin Sheridan managed to keep his performing and publishing identities separate for a number of years. According to available court records, that use of multiple names may have been a ploy to avoid debt incurred while working as a professional actor. 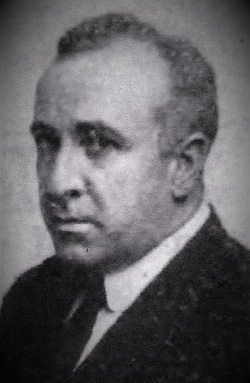 John Franklin Sheridan, lyricist, actor, and owner of John Franklin Music Company. And just then I awoke. What would the grafters do? 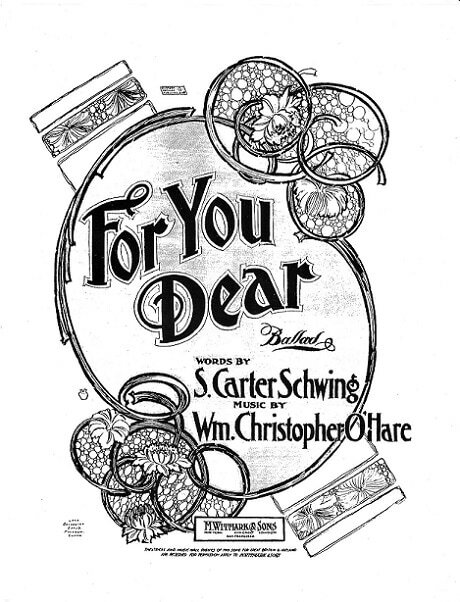 Although O'Hare's last located collaboration with former Shreveporter S. Carter Schwing was copyrighted in 1904, in 1906 O'Hare dedicated a song to Schwing, by then Secretary and Treasurer of Spencer's Business College in New Orleans. A 1920 New York Times obituary describes lyricist Charles Noel Douglas as having "written many books, plays and songs," despite having been "a bed-ridden cripple for thirty years." Marketed by Witmark as appropriate for commencement exercises, Good Fellowship is a song of friendship, the strength that friendship can bring an individual in troubled times, and the harmonious brotherhood it brings to humankind. In 1907, O'Hare composed the music for a lyric by B. Bristow Owsley (1882-1967). The only reference found to this song appears in WorldCat for a copy at the British Library, St. Pancras. Listed as B. Bristone Orusley for this title on WorldCat but correctly on other items, Owsley appears in several public records as a Chicago printer. The Chicago Tribune occasionally published a poem with his byline, and other Owsley works appear on WorldCat, including A Song Feast of Spirituals (Chicago: Will Rossiter, 1936). Owsley, who died in Los Angeles, appears in the ASCAP Biographical Dictionary of Composers, Authors, and Publishers. 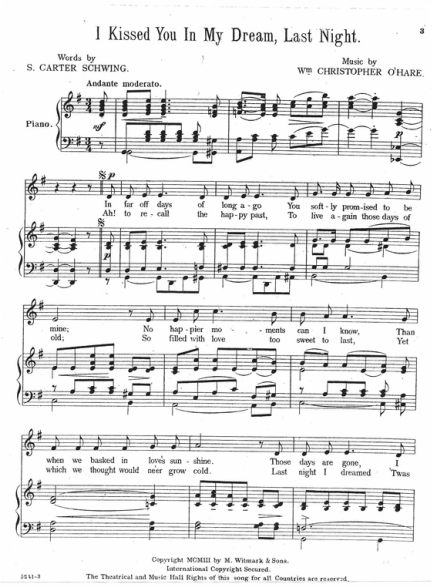 In 1909, O'Hare set to music a B. Bristow Owsley lyric that could be said to support the saying "All's fair in love and war"--or, at least, in love. Although Hoyle's famous rules apply to the first-verse poker game, according to the remaining verses, they don't apply to love.